August 19-20, 2017: The TOUGH MUDDER – billed as the “toughest event on the planet”, this 10-12 mile, 20+ obstacle course race is designed by British Special Forces. First held locally in 2013 at Gunstock, the event moved to the NH Motor Speedway in 2016. For the less tough, there’s a Half Mudder (5 miles, 13 obstacles); and for the kids, a Mini Mudder (1 mile, ? obstacles). All three Mudders will take place on both Saturday and Sunday. August 13-14, 2016: The TOUGH MUDDER – billed as the “toughest event on the planet”, this 10-12 mile obstacle course race is designed by British Special Forces. Last held locally in 2013 at Gunstock, the event will be now be held at the NH Motor Speedway. October 22, 2016: New Hampshire Pumpkin Festival. After 24 years in Keene, the Pumpkin Festival moved to Laconia in 2015. This year’s event will be the second held in Laconia. 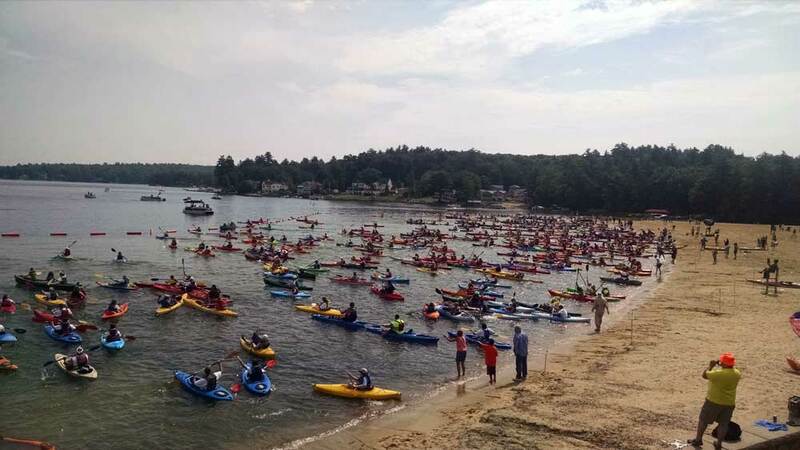 August 3, 2014 – Hundreds of kayaks and canoes launch from Weirs Beach into Lake Winnipesaukee, setting a Guinness World Record for the largest simultaneous boat launch. August 3, 2014: The 2nd annual Lakefest Raft-a-Palooza. A second attempt to set the world record for the largest free-floating raft of canoes and kayaks. Funds raised support the NH Lakes Association’s mission to protect New Hampshire’s lakes through education and advocacy. Immediately following the rafting attempt, this year’s event features entertainment, activities, vendors and educational displays in the Endicott Rock Park parking lot, from about 11am-3pm. The public is welcome to attend. September 12-13, 2014: The 16th annual REACH THE BEACH NEW HAMPSHIRE RELAY – one of the longest distance running relay races in the United States, this relay race will start at the Cannon Mountain ski area in Franconia, and finish at Hampton Beach. The relay will consist of several twelve-person teams that will rotate through 36 transition areas as they cover the approximate 200 mile distance of the race. Each relay team member will run three legs of varying lengths and difficulty and will cover an average total distance of about 16.6 miles – about 60% of a marathon’s distance. The runners will rotate in a set order once the race begins and will be obligated to follow this rotation until the final runner Reaches the Beach! The race reaches its halfway point just before passing Weirs Beach on Parade Road (Route 106) during the races’ 17th leg. October 4, 2014: The 22nd Annual New Hampshire Marathon features a course around Newfound Lake. June 1-2, 2013: The TOUGH MUDDER – billed as the “toughest event on the planet”, this 10-12 mile obstacle course race is designed by British Special Forces and will be held at Gunstock. Participants will brave freezing cold water, wade through thick mud, tackle underwater tunnels, finesse high ropes, scramble through multiple cargo nets, and navigate their way through a gauntlet of electrified wires. The course is a test of all-around strength, stamina, and mental grit, but also a test of camaraderie and team effort, as participants need to help each other to make it though the course. Participants may don traditional running attire, but costumes are encouraged.